Remember that USD/JPY setup from yesterday? Well, it looks like the pair might be headed for a breakout after all. The pair is forming a possible symmetrical triangle after falling sharply early this week. If you’ve read the School of Pipsology, then you’ll know that we might be looking at a possible bearish pennant in the making. Think we’re in for more dollar losses? Waiting for a short entry near the 100 and 200 SMAs might be a good idea if you think that the consolidation still has room to breathe, but you can also wait for a downside breakout if you think that the Greenback won’t go any higher before resuming its fall. 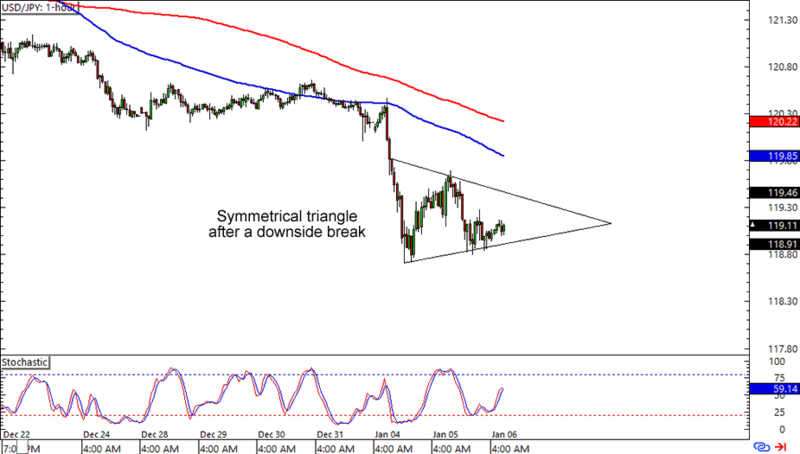 Be careful though, as symmetrical triangles do tend to show upside breakout at times! I spy with my Ray-B-covered eyes a possible entry for a downtrend! AUD/USD looks like it’s headed for the .7200 handle, which is just above a falling channel resistance on the 1-hour time frame. What makes this setup interesting is that the 100 SMA has also just crossed below the 200 SMA and Stochastic is almost at the overbought territory. A short near the .7200 levels is one of the best places to enter this downtrend, but you can also look at other levels along the channel if the pair doesn’t quite reach the major psychological area before seeing more weakness. Last but definitely not the least is a possible trend shift in GBP/NZD. I know how you guys love trading strong trends, so this might be helpful to those who are trying to catch a bottom. 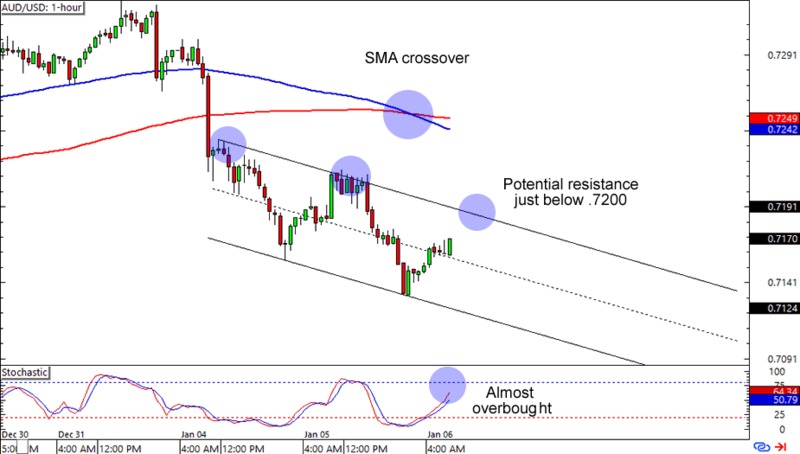 The pair found a double bottom support at the 2.1525 levels and is now flirting with the 2.2000 psychological handle. 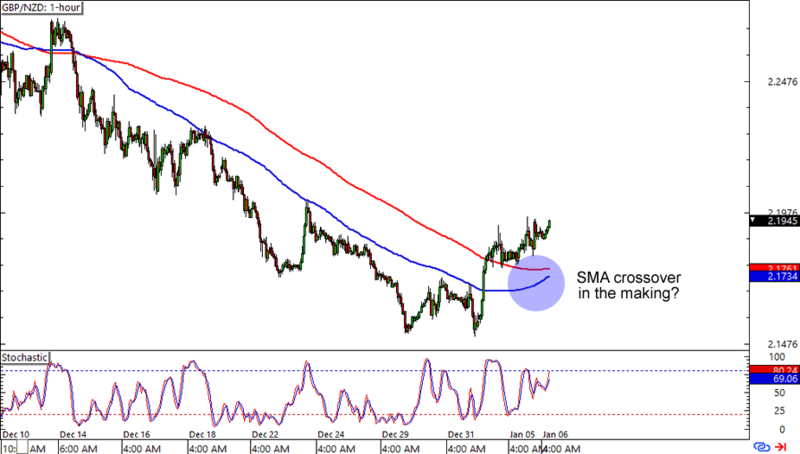 A break above the levels could lead to more gains for the pound, which would probably push the 100 SMA above the 200 SMA and indicate a start of an uptrend. Entering at current levels could get you some good pips if you think that an uptrend would find momentum, but you can also wait for either a break above 2.2000 or a retracement to the SMAs if you’re not convinced that the tides are turning for the pair.